Composed of professional services such as those supporting online education and faculty recruitment that help institutions support teaching and learning objectives, the academic services market is serving key postsecondary priorities. With institutional leadership focused heavily on instructional objectives, the academic services market is growing rapidly as technology's advances also help fuel this market. Online higher education's expansion is resulting in major demand for new faculty skill sets and ready-to-teach online courses, with recruitment firms and online program suppliers actively addressing these opportunities. 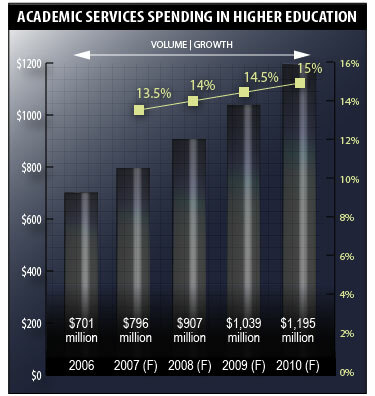 Eduventures forecasts the academic services market will experience high growth through 2010 and reach nearly $1.2 billion in revenues by that time. As institutions shift into new modes of course delivery, external service providers are helping schools to address their teaching and learning objectives through a variety of services supporting online education, including course development and academic support services. In addition, institutions are eager to partner with companies able to assist in faculty recruitment to support growth of ground and online instruction. Also of importance are online tutoring and student support services, a developing component of this market that is now augmenting, and in some cases supplanting, the traditional face-to-face tutorial model staffed by college employees or fellow students. Noah Carp is a senior analyst with Eduventures, an education consultancy and research firm based in Boston.